Note: A user requires the same SI-Net access as users using the CSV upload process to be able to use this process. If a user does not have the relevant SI-Net access, a message will be returned at the time of attempting to submit the data. In Semester 1 2019 the Upload Grade to SI-NET function will not be enabled in your course by default. Refer to the Enable the Upload Grades to SI-NET guide on how to do this. Open your Learn.UQ (Blackboard) course. From Control Panel, select Grade Centre > Full Grade Centre. 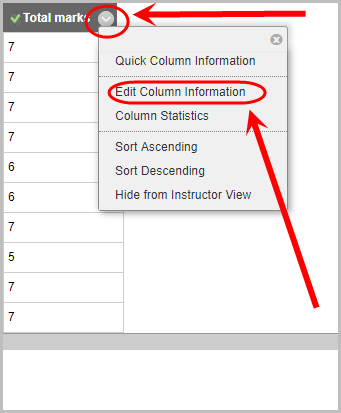 Click on the drop-down arrow next to the column containing the final grade. Select Set as External Grade to ensure a green tick appears in that column. Note: This procedure must be done if the grades are to be uploaded to SI-Net. Refer to the guides Weighted Column or Grade Schema for more information. 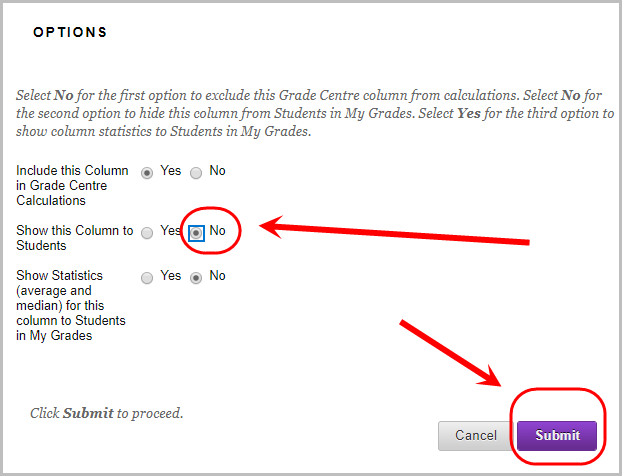 Note: The column Set as External Grade must be used to indicate which column grades are to be uploaded from Grade Centre to SI-Net. 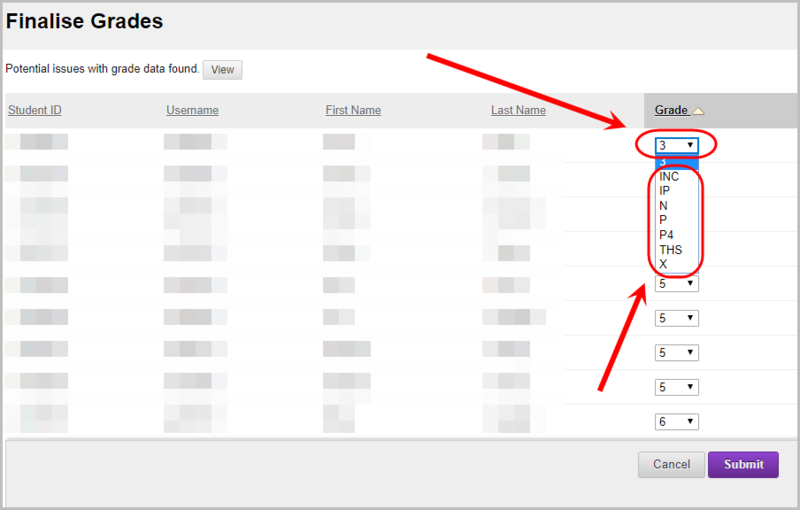 Results can be changed to letters in the next upload page. 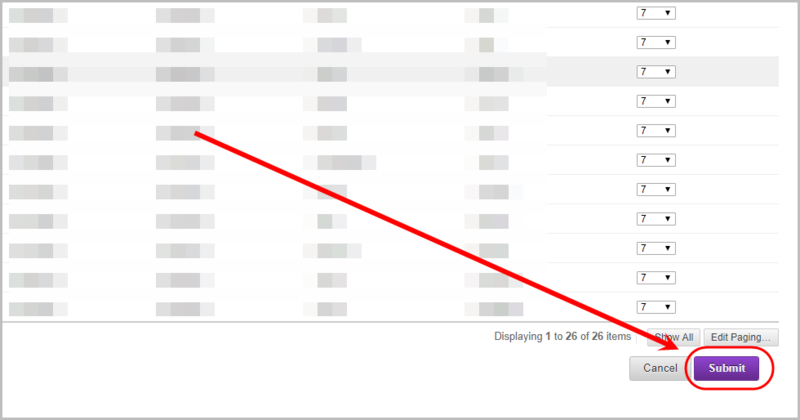 Note: To remove the Set as External Grade option on a column, refer to Step 3 and 4 to another column. 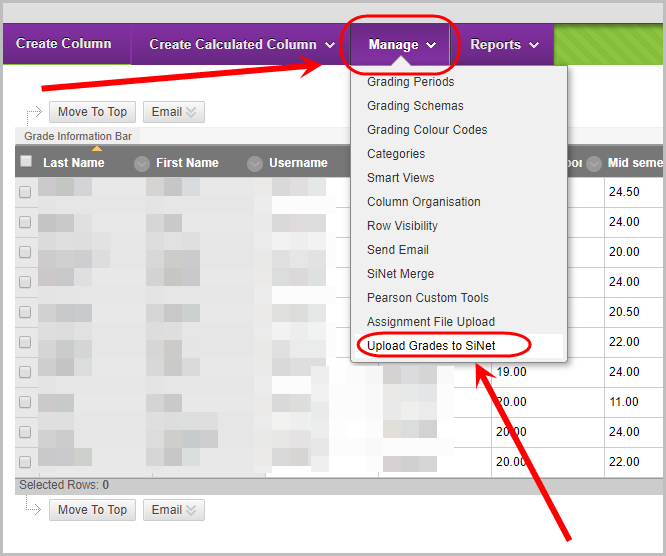 Ensure that the column that is Set as External Grade (green tick) is hidden from students by selecting the drop-down arrow then Edit Column Information. In the Options setting, select the No radio button for the setting Show this Column to Students. Select Manage > Upload Grades to SiNet. Warning: If no column has been set properly using the Set as External Grade option, a message is returned when trying to access the Upload Grades to SiNet page. If required, the grades can be changed to the following grades by selecting from the drop-down list of a grade. Note: Numerical grades cannot be changed in this page and must be amended in Grade Centre before proceeding to upload to SI-Net. Note: Grades that have been finalised or official grades in SI-Net cannot be overridden and will not have a drop-down option. These values also have a black border around the student's name. Once grades have been reviewed, select the Submit button. Once uploaded succesfully, the process will be completed. Note: If the Grade Roster is closed, the following message is displayed in the Upload Grades to SiNet page.